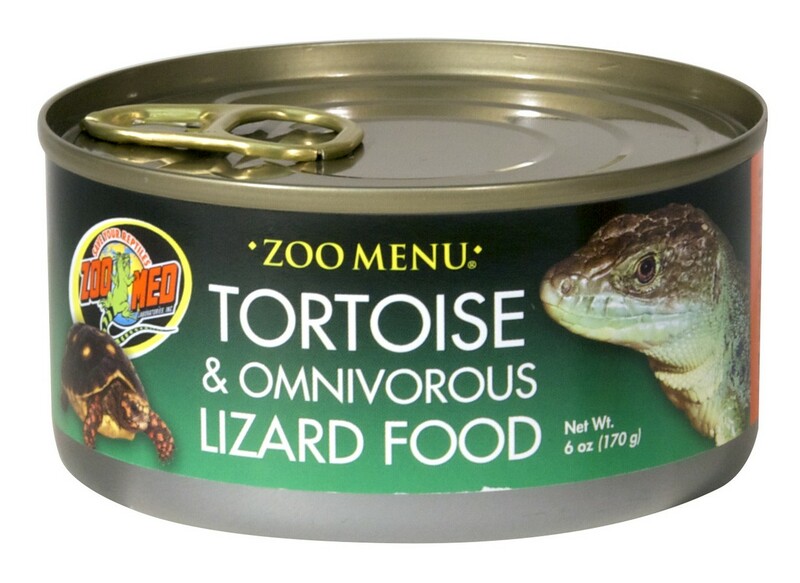 Zoo Menu® Tortoise & Omnivorous Lizard Food | Zoo Med Laboratories, Inc.
Canned, wet food for Land Tortoises and omnivorous Lizards. Contains Opuntia Cactus, whole peas, apples, and a vitamin/mineral supplement. Land Tortoise: Open can and spoon out 2 full tablespoons 1/4 can) of food per 8″ (20cm) of tortoise being fed (i.e. 8″ Hingeback Tortoise gets 1/4 of a can per feeding). Place Tortoise next to food and leave undistributed for 1 hour while feeding. Omnivorous Lizards: Feed 2 full tablespoons (1/4 can) of food per adult lizard being fed. Leave food in cage all day, but replace the following day or if food dries out. Promptly refrigerate any uneaten food in separate plastic container. Not for human consumption. Water Sufficient for Processing, Apples, Carrots, Ground Corn, Nopales (Opuntia Cactus), Whole Peas, Soybean Meal, Dextrose, Dried Kelp, Brewers Dried Yeast, Guar Gum, Banana Flavor, Choline Chloride, Riboflavin, Niacin, Thiamine Mononitrate, Pyridoxine Hydrochloride, Vitamin B12 Supplement, Menadione Sodium Bisulfite Complex (Source of Vitamin K activity), Calcium Carbonate, Vitamin E Supplement, Vitamin A Acetate, Folic Acid, d-Calcium Pantothenate, Vitamin D3 Supplement.